Cassius Marsh plays for the San Francisco 49ers and has had his presence as a renowned defensive end duly felt by the team since his entry. The NFL player was popular in college too, playing for his school team at UCLA all through his college years. Marsh was also a popular player at New England Patriots. Apart from his moves on the field, there is another side to the life of the NFL player. Here are lesser known facts about Cassius Marsh. He was born on July 7, 1992, in Mission Hills California. Marsh’s interest in American football started at a very young age. His outstanding skills in high school earned him the 22nd spot as the national defensive tackle by Tom Lemming / MaxPreps. The talented player also earned a spot on various football ranking platforms during his high school days. By the end of his senior season in high school, Marsh had already recorded 23 sacks and 83 tackles. After high school, Marsh proceeded to the University of California and became a member of UCLA team. He started his professional career in the year 2014 when he was drafted by the Seattle Seahawks in the fourth round at the 2014 NFL Draft. He was the 108th overall pick. Cassius was subsequently signed on a four-year contract with the team and played for three seasons. He moved to New England Patriots in September 2017 after he was traded in exchange for the team’s 5th and 7th selections at 2018 NFL Draft. His next move was to the San Francisco 49ers in February 2018. After he was released by the New England Patroits in November 2017 he signed a two-year contract extension with the 49ers. 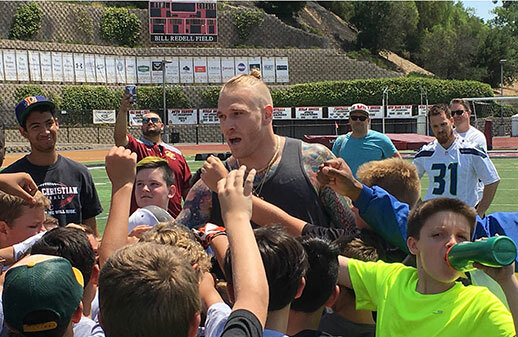 Cassius Marsh has his skills on the field to thank for his financial status. The renowned player sits on an estimated net worth amounting to millions. The defensive end has as his cap hit for 2018, a total of $3,481,250 and $1,100,000 as his base salary. In the year 2017, he garnered a total of $244 thousand which placed him as the number 110 overall in the NFL. Cassius Marsh was born to his parents Curtis Marsh Sr. (father) and Holly Amm LeBlanc, (mother). It must have been a matter of heredity for Marsh who came from a family of football players. His father played as a wide receiver in the Canadian Football League and the NFL as well. He joined the NFL in 1995 when he was drafted by Jacksonville Jaguars in the seventh round. Other teams where he exhibited his football expertise include Pittsburgh Steelers and Saskatchewan Roughriders. Cassius has a half brother, Curtis Marsh Jr. from his father. Marsh Jr. is also a football player who plays for the Cincinnati Bengals. Marsh Jr. joined NFL officially in 2011 when he was drafted in the third round by the Philadelphia Eagles. He also played during his college years at Utah State where he was a running back for 2007 and 2008 seasons and a defensive back for the 2009 – 10 season. Like his counterparts, Cassius Marsh surely has stories to write down in his love diary. But we may never get to tell all sides of this story as the NFL player is quite private about his personal life. Little is known about the personal life of the defensive back who seldom talks about his girlfriend. Her name is not known as the player has not provided it to the media. But the certain notion remains that Cassius Marsh has a girlfriend. To further buttress this view, he has proposed to his said girlfriend. Though Marsh is not married to anyone right now, his fans are optimistic of the possibility of hearing the resounding wedding bells soon. Cassius Marsh is not only good because of his football bloodline, but also has the right body that suits his career. He stands at a height of 6ft 4in which is quite proportional to his weight of 253 lbs. The skilful player has an arm length of 32 ¾ inches and a hand size of 9 ½ inches, sturdy enough to hold a strong grip, as well as ward off blockers. Marsh who is always strong to play even after the whistle goes off is known for his massive energy which he exhibits through his intensity and durability on the field.